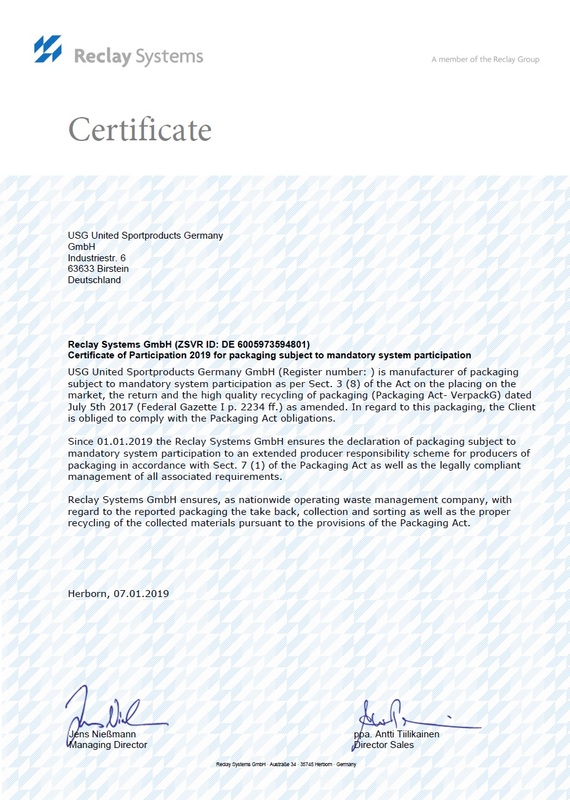 We - USG United Sportproducts Germany GmbH are registered with all our brands in the central packing register LUCID with the number DE4828508858171-V according to the Packaging Law (VerpackG) starting at 01.01.2019.
regarding § 6 (3) Packaging regulations. USG complies with the HACCP concept. This guarantees the trade and consumers a careful handling of the Articles and guarantees purity and quality. Return samples allow traceability, best before dates and batch numbers provide transparency. As a brand owner and distributor of supplementary feed for horses as well as care products for horses, USG complies with the HACCP concept according to the current feed law. Currently, USG is switching its suppliers to the high BSCI standard. High social minimum requirements, environmentally friendly production and transport are increasingly being enforced as a philosophy of the company and should be met as soon as possible to 100%.